Last week I got to spend a whole day wandering around London. I brought my Mummy with me to carry me around (walking tires me out so I have less energy for mischief) but I got to choose where we went. I spent ages circling places with interesting names in my guidebook and off we went! We started with a trip on one of my favourite forms of transport, the Tube. You get to go underground, I’m planning on talking to their engineers when I’m building my own secret tunnel system. My first stop was the Jewel Tower. I was so excited, I was going to see so much gold and those coloured stones that girls seem to like. I mainly like gold. I think I may have been a dragon in a past life… There was only one problem. They’d taken all the jewels away 🙁 False advertising!!!! 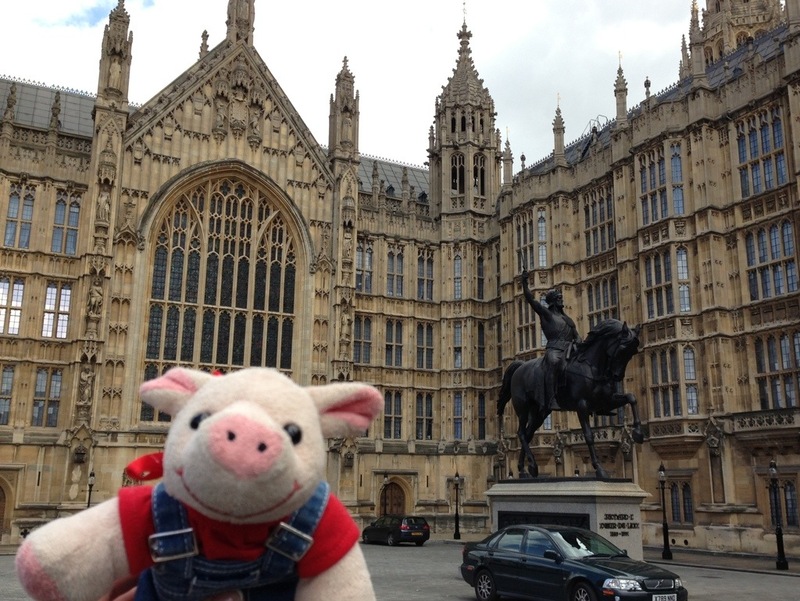 So onwards to the Houses of Parliament. It’s a nice building, lots of turrets and flags which I definitely approve of. And I saw a great statue of a king on a horse, I’m going to get one of those made with me sitting on a squirrel. It’ll look great outside my future palace. I may even use the image for the reverse sides of my currency. I was planning to go into the Parliament to show them all how a country should be run but then I got hungry. 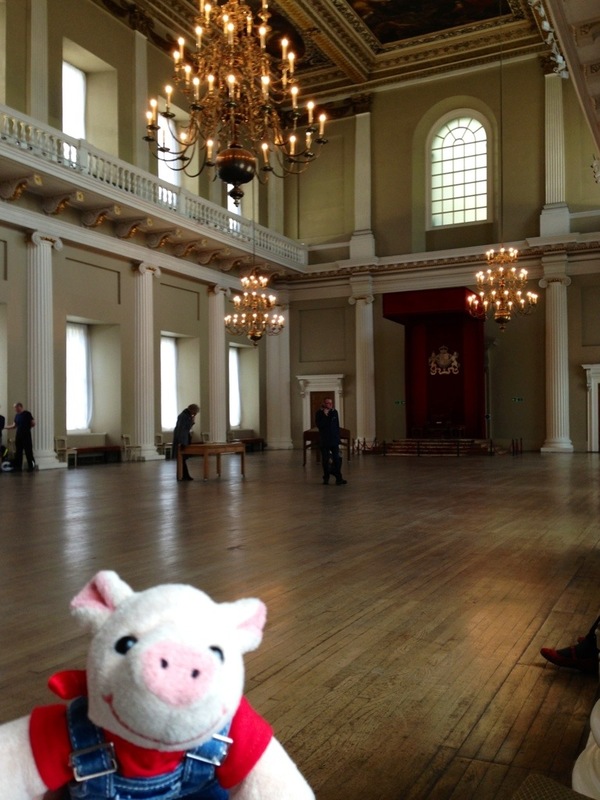 So on to the Banqueting House at Whitehall. I was really looking forward to having some great food here but once again, false advertising. There was no food at all! I decided to stick around to have a look anyway (in case the food was in a secret room somewhere). I did get some decorating hints for my future palace, I will be having a similar throne for example. And I will be getting a ceiling painted in a similar way. The audio guide said a man called Rubens painted it, he doesn’t seem to be on Facebook so if anybody has his phone number or email address, please let me know. I think he’ll like my plans, each panel will be an image of me. 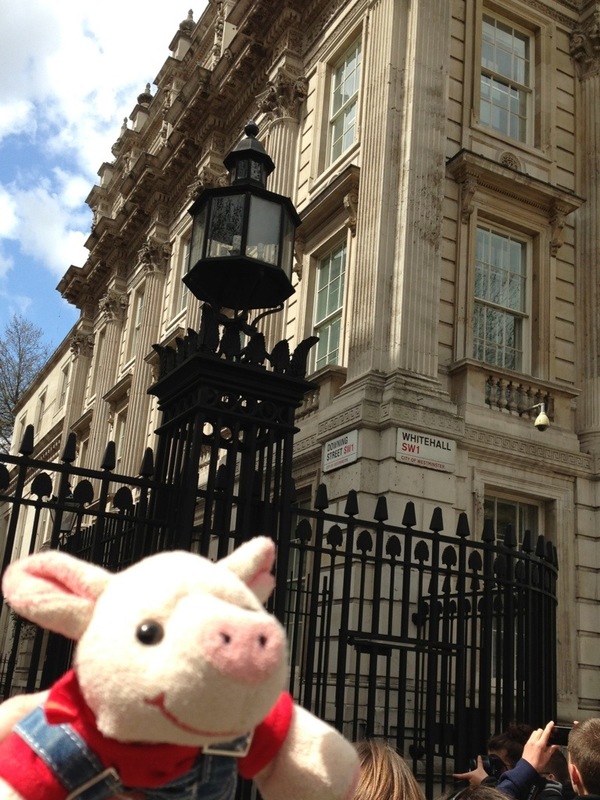 After a quick stop at the chocolate shop, I dropped in to Downing Street to have a chat with my friend David. He needed some advice on world politics and I was the obvious person to ask. There were guards outside the big gate but I just walked straight through the barriers. I left Mummy outside because she would cramp my style. David gave me some lunch but all the sandwiches had cucumber in them so I just had my chocolate. 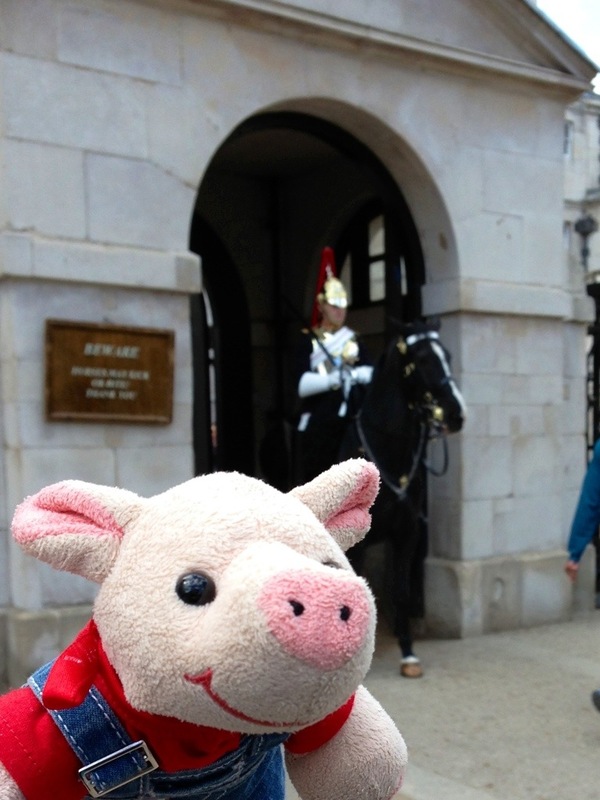 My last stop before I got back on the Tube was to the Horseguards Museum. I had a chat with some of the horses, they seemed to be interested in my employment terms (including unlimited carrots, I have absolutely no interest in carrots so they can happily have them). The day ended really well with a trip to Sherlock Holmes’ house but I already told you about that. So now I’m off to the garden to practice tunnel digging. I’m hoping to persuade the squirrels to do all the hard work. 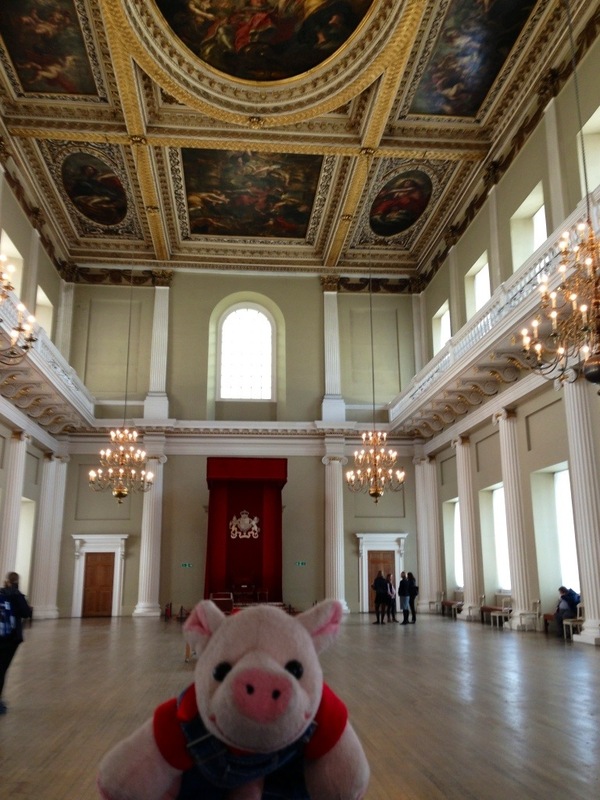 This entry was posted in Uncategorized and tagged Banqueting Hall, Jewel Tower, Westminster. Bookmark the permalink. Hi Oink, i think if you wish to take over the world you should not be “hoping to persuade the squirrels” you should dictate and assign suitable punishment if they don’t. If i do accept oink i will have to bring my colleagues, Invader Zim and Girr, you will be pleased to note that they are sound military tacticians, strict disciplinarians, and extremely loyal to the cause.